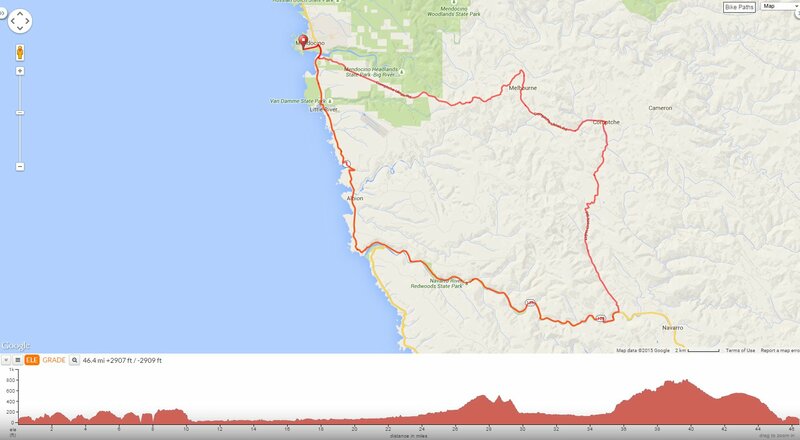 Day 8-This ride heads south from Mendocino on Hwy 1 through the scenic towns of Little River and Albion to the Navarro River’s mouth at CA-128. Roll along the Navarro River under the beautiful forests and travel north along Flynn Creek to the small town of Comptche. Return west on Comtche-Ukiah Rd to Hwy 1. Head out of Mendocino on Main St. Turn right onto Hwy 1 S and cross the bridge over Big River at Mendocino Bay. Hwy 1 S climbs up to the headlands before dropping down past the beach at Van Damme Beach State Park. The road tilts up for a short climb to the next town of Little River. Hwy 1 S continues along rolling terrain through the evergreen forests past Stillwell Point to Andiron Seaside Inn & Cabins. The road rolls up and down to the bridge crossing over the Albion River-enjoy the river and ocean views around Albion Cove and Albion Head! Hwy 1 S climbs up from the Albion River and quickly rolls through the town of Albion to Whitesboro Cove. The road winds along the top of the bluff with wonderful views of the headlands. Hwy 1 S continues from Navarro Point with a sweeping descent from the ridge top to the river below. Enjoy the views of the Navarro River at the river’s mouth! Go straight onto CA-128 E and ride along the scenic Navarro River. The road continues through the dense forests around Navarro River Redwoods State Park; this is one beautiful stretch of road! At mile 22.4-turn left onto Flynn Creek Rd; this is a quiet country back road with minimal traffic. The rolling terrain on Flynn Creek leads you along the creek through the beautiful woodlands to Wolfey Gulch. The road climbs out from the gulch to the country ranches and homes at Keene Summit; it’s 1.4 miles with grades of 3-5%. Flynn Creek Rd goes up and down for another series of short pitches and descents before rolling into the town of Comptche at the Comptche-Ukiah Rd junction. Head west on Comptche-Ukiah Rd for the next 14.4 miles; the first 4.4 flat miles leads you out of town along the Albion River through Morrison Gulch to the unincorporated town of Melbourne. Comptche-Ukiah Rd crosses over Tom Bell Creek for a short climb towards the ridge with steep grades of 9-12%! The road continues with a series of short climbs as it winds away from the river through the forest to the small community of homes near the junction at Little River Airport Rd. Comptche-Ukiah Rd emerges out from the evergreens to the open ridge. The road straightens out for a nice stretch along the forests surrounding Van Damme Beach State Park before descending out towards the coast onto Hwy 1. Take Hwy 1 N across Big River and return on Main St into Mendocino. This fabulous ride along the Navarro River to Flynn Creek and Comptche is a wonderful conclusion to the cycling portion of the tour along the North Coast! You’ll enjoy the gorgeous river views and the beautiful stretch under the redwoods to the quiet country back roads into and out of Comptche!